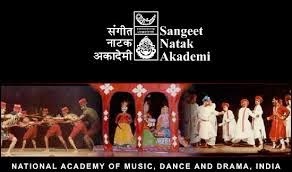 The General Council of Sangeet Natak Akademi, the National Academy of Music, Dance and Drama, New Delhi has declared fellowships (AkademiRatna) and Akademi awards (Akademi Auraskar) for the year 2013. A decision to this effect was taken in a meeting held recently (on 21 November 2013) where three (3) eminent personalities in the field of performing arts, namely Smt. Kanak Rele, Shri R Sathyanarayana and Shri MaheshElkunchwar as Sangeet Natak Akademi Fellows (Akademi Ratna) were elected. The Fellowship of the Akademi is the most prestigious and rarehonour, which is restricted to a very limited number at a given time. Presently there are only 40 Fellows of the Sangeet Natak Akademi. The General Council of the Akademi also selected thirty eight (38) artists (2 Joint Awards) from the fields of Music, Dance, Theatre and Puppetry for theSangeet Natak Akademi Awards (Akademi Puraskar) for the year 2013. In the field of Music, nine eminent artists, namely Shri Ritwik Sanyal, Smt. Veena Sahasrabuddhe in Hindustani Vocal; Shri Hashmat Ali Khan, Hindustani Instrumental Music (Tabla); Shri Dhruba Ghosh, Hindustani Instrumental Music (Sarangi); Smt. Aruna Sairam, S/Shri D. Seshachari & D Raghavachari Hyderabad Brothers(Joint Award) in Carnatic Vocal; Shri Trichy Sankaran, Carnatic Instrumental Music (Mridangam); Shri Thiruvizha Jayashankar, Carnatic Instrumental Music (Nadaswaram) and Shri Bankim Sethi, Major Traditions of Music (OdissiMusic) have been selected for the Akademi Awards 2013. In the field of Dance, Smt. Jamuna Krishnan and Shri B Herambhanathan, (Bharatanatyam); Smt. Rajashree Shirke (Kathak); Shri Kalamandalam M P SNamboodiri, (Kathakali); Shri Chinta Seetha Ramanjaneyulu (Kuchipudi); Smt SangeetaDash (Odissi); Shri Jogen Dutta Bayan (Sattriya); Shri Srinivasa Rangachariar (Major Traditions of Dance & Dance Theatre (Arayer Sevai) and Shri Dhaneswar Swain, Music for Dance have been selected for the Akademi Awards 2013. In the field of Theatre, eight eminent persons have been selected for AkademiAwards 2013. They include Shri Rameshwar Prem, Shri Pundalik Narayan Naik in Playwriting; Shri Kamalakar Muralidhar Sontakke, Shri Kewal Dhaliwal, Smt. PrasannaRamaswamy in the field of Direction; Shri Vasant Josalkar, Smt Kusum Haidar in Acting and Shri Krishna Borkar in the field of Allied Theatre Arts (Make-up). For their contribution to Traditional/Folk/ Tribal Music/ Dance/ Theatre and Puppetry, eight artists have been selected for the Akademi Awards. They are Smt. Raj Begum, Traditional, Folk Music/Dance & Theatre (Jammu & Kashmir); S/Shri T.A.R.Nadi Rao & N Jeeva Rao (Joint Award), Folk Music (Tamilnadu); Shri Gurdial Singh, Instrument Making (Punjab); Shri Mohan Singh Khangura, Rabindra Sangeet (West Bengal); Shri Umakanta Gogoi (Bairagi), Tokari Geet and DehbicharGeet, (Assam), Smt Lilavati M Kavi (Bajaj), Puppetry; Smt Meenakshi, Instrument Making - Ghatam (Tamilnadu) and Shri Sheikh Riyajuddin alias Rajubaba, Folk Theatre ( Maharashtra). Shri Mysore V Subramanya (Performing Arts) and Shri N Ramanathan (Music) will receive the Akademi Awards 2013 for Overall Contribution/Scholarship to Performing Arts.